Note: This feature is the transcript from a live event produced by HarperCollins for its popular Eos imprint. The live event took place online during the annual Internet-only science fiction/fantasy conference, Eos Con III. The topic of this panel was Worldbuilding From the Ground Up. The panelist are bestselling fantasy authors Dave Duncan, Dennis Jones, Anne McCaffrey and Juliet McKenna. Moderator: Welcome to Worldbuilding From The Ground Up. Dave Duncan, Dennis Jones, Anne McCaffrey and Juleit McKenna discuss what it takes to build a world and bring it alive with characters and story. Who on the panel would like to start? Okay, perhaps Juliet McKenna? Moderator: What was your inspiration for the plot? And could you tell us a little about your books? Juliet McKenna: I wanted to see fantasy from the ordinary person's viewpoint. Often, however good a story is, there's a gap you just can't cross, because the hero has some key ability or advantage such as being able to talk to dragons that is crucial to their winning. I wanted to see how an ordinary person (sort of) would cope if she got caught up with wizards and great quests. That's what happened to Livak, the heroine of Thief's Gamble. Juliet McKenna: I also wanted to try and realize a fully rounded world, where the implications of having magic were explored. Moderator: So for you it was an adventure of discovery? Juliet McKenna: Pretty much, driven by the plot but also rooted in my own background in history. Question: Did you have a world map before you wrote the book? Juliet McKenna: Me? kind of -- it was a rough sketch... and then, when the publisher wanted a real map, my engineer/draughtsman husband took over. Question: Is there more or less freedom in fantasy world building, as opposed to science fiction? How long did you spend working on the details of the world before writing the story, or did you just make it up as you went along? Juliet McKenna: Freedom? I'd say either is only limited by your imagination -- as long as you keep the internal logic consistent. I had the basics clear in my head, different countries, power structures, conflicts. The detail comes as I write -- and then I have to make sure I remember what I've said before. Anne McCaffrey: Internal logic is essential in either sf or fantasy. You have to believe what you're writing, where you are so that comes across to the reader. My misspent youth as a stage director of opera is very useful. Anne McCaffrey: My misspent youth is no laughing matter! Juliet McKenna: I did amateur dramatics and would agree. Anne, your use of language has always struck me as a very effective feature of your world(s). How did you develop that? Anne McCaffrey: I studied Slavonic Languages in college...I can still swear in Russian. I also tried not to use too many Latin based words on Pern. They didn't study it either. Dennis Jones: As for me, I constructed world, plot, and characterss in tandem, really. I had an initial concept of the world, and that fed into the nature of the chief characters, and in turn that helped guide the plot. Actually The Stone and the Maiden is set in a world similar to that of the middle Byzantine Empire(c.800 AD). Juliet McKenna: How tightly do you keep yourself to that? Dennis Jones: Not at all rigidly. It's more of a guideline-- the level of technology, administrative organization, internal (and bloody) power politics. Anne McCaffrey: You used it well. Moderator: It seems that a knowledge of the working of history is key to creating a fantasy world then? Dennis Jones: Thank you! In my case a knowledge of history has been a great help. Otherwise I'd have to make everything up. And just about everything has happened at one time or another. Juliet McKenna: I think so, if you are to maintain plausibility. Yes, Dennis, and that gives me a feeling of security, in case anyone comes up to challenge me on something. Anne McCaffrey: Ours is not to ponder what were fair in Life, but finding what may be, make it fair up to our means. Question: Is a true knowledge of planets necessary? Anne McCaffrey: The planet your characters are on, surely. Question: What about the actual geology of a planet. Does that shape the story or is that incidental? Anne McCaffrey: I cheated. I used a Parallel Earth -- Resources Negligible. Juliet McKenna: I get by on some basic geography/geology and being vague about detail -- and by staying firmly dirtside. Dennis Jones: My world is geographically and meteorologically Earth. Not all the fauna and flora, though. Anne McCaffrey: I also find experts willing to find me the specifics I need. Question: Anne McCaffrey -- How did the brainships come to be? Anne McCaffrey: I had read a very sad story and wanted to change the circumstances for the characters. Question: What do you think about people who make planets all one thing? Juliet McKenna: Do you mean all desert or ice or such? Anne McCaffrey: All one type of planet? Try Vernon Vinge's latest novel. Question: Yes, like a lot of the Star Wars & Star Trek planets. Anne McCaffrey: Star Trek and Star Wars were limited by the expense of the sets. Juliet McKenna: Polystyrene rocks for Planet of the Week. Question: Anne McCaffrey -- Do you know the end/solution to a book like The Tower and the Hive and then write/outline the book to get there? Anne McCaffrey: I have never used an outline -- I just tell a story. I never really know how it's all going to end. Dave, do you? Dave Duncan: Do I what? I've just arrived so I haven't got a clue what we're talking about. Moderator: Dave, the other authors have had a chance to give their views on it takes to build a world and bring it alive with characters and story. Anne McCaffrey: Outline your marvelous stories like Gilded Chain -- that's a commercial, folks. Dave Duncan: Ah, I always wondered. I think the operative word is story. Everything has to follow that -- world, characters, mood. I decide on an ending and then a beginning, and just go. Juliet McKenna: I have to have beginning, middle and end, at least in outline before I start typing. Anne McCaffrey: Often, I have to go back later and add something in. Dennis Jones: Unless an editor demands one! Dave Duncan: There's nothing duller than a travelogue for an imaginary world. Only stories are interesting. Only people that is. Juliet McKenna: No, it's pages and pages of notes for me, from a one page outline to detailed structures for each chapter. Anne McCaffrey: Lists, I make lists -- but I already have lists of names ready to use. I see some I recognize from another source. Dennis Jones: Names drive me nuts. I also have lists of them. Dave Duncan: Every book is a little different, though. Question: How difficult do you make your books? What reading level, and the complexity of your stories, are they the same quality as Tom Clancy? Anne McCaffrey: Who wants to make books difficult to read? Dave Duncan: James Herriot said that there was nothing harder than a simple style, and he ought to know. I try to make my writing transparent, so it doesn't call attention to itself. The story's the important thing. Question: Do you use real life names, borrow them, or tweak them? Anne McCaffrey: I tweak names but don't be surprised if some of your names end up in my next book. I agree with Dennis -- the story is the most important factor. Juliet McKenna: The detail of the world should always be slipped in largely unnoticed, I think. Anne McCaffrey: Heckfire man, I noticed. Dave Duncan: Names can come from anywhere: Anglo-Saxon in one book, an atlas of central Asia in another. Juliet McKenna: Yes, but hopefully you didn't find the story derailed by massive data dumps? Dennis Jones: I usually dig around on the Web, then tweak what I find. At the moment I'm using Turkish names, modified. Anne McCaffrey: Hey, BBC credits are very good for finding unusual names. Juliet McKenna: I find newspapers, National Geographic etc. great sources. Also obit columns -- you'd be amazed the names folks give their kids. Anne McCaffrey: Not at all -- at least when you do autographs you find out for sure. Dave Duncan: The U.S. census publishes lists of all first names used in the U.S.
Anne McCaffrey: Try Baby Name Books for pan-ethnic ones. My brother Kevin thought up what Pern meant. I just picked the name at random. Question: What is everyone's favorite real-world thing that you inserted into the fantasy world? Juliet McKenna: I've just found a use for a medieval way of using cattle bones to make a floor surface. Question: Do you prefer to have your characters impact your world, or your world impact your characters? Dave Duncan: The world has to serve the story, if that's what impact means. Anne McCaffrey: A bit of both...I've been living in Ireland -- a foreign country for thirty years. Juliet McKenna: Though the characters have to be believably of their world, not have 20th century PC ideas etc. Dennis Jones: Agree with Dave. World serves story. 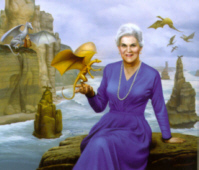 Anne McCaffrey: Right, I was careful about attitudes on Pern. Dave Duncan: If I wrote a character who really thought like, say a conquistador, the readers couldn't stomach him. We really use modern people in period costume. Dennis Jones: There's a balance you have to strike. It's one way the world affects characters. In a violent world, meek people tend to get trampled. Juliet McKenna: There's a lot that's common to people in all ages, studying ancient roman letters showed me that. Anne McCaffrey: Listening to the modern Irish in the pubs taught me a lot, too. Question: But in Pern, Jaxom and Ruth has an impact on the world rather than the reverse, no? Anne McCaffrey: Jaxom and Ruth have an impact on their world but of and from their Pernese heritage. Question: Final Fantasy uses natural events as names for their main characters: like Cloud or Squall. Do you use natural forces as names? Juliet McKenna: Not so far. I think I'd need a good reason to do so. Dennis Jones: I don't either. "Lilt" is as close as I've come. Question: Is it hard though in a hi-tech scenario not to plagiarize and use others forms of drive or technology? Anne McCaffrey: Admittedly I imposed a good deal of modern technology on Pern but because they had no other way to get rid of their planetary menace. Juliet McKenna: All my science has been learned reading Larry Niven so I don't see me trying hi-tech. Anne McCaffrey: Finding relevant experts is useful -- if they have read sf as Dr. Jack Cohen did when he helped me design Dragonsdawn. I learned a great deal from Isaac Asimov, too, bless his heart. Dennis Jones: Sorcery and hi-tech often function the same way -- devices to advance plot. Anne McCaffrey: Hi-tech to many IS sorcery, Dennis. Juliet McKenna: I went to a very interesting panel on Superman comics at a recent con -- and many of the problems of having superheroes in your world apply equally to wizards. Dennis Jones: Point well taken, Anne! Anne McCaffrey: Look what happened to Merlin. Dennis Jones: Total system crash. Dennis Jones: It was a pleasure being here. Hope to do it again. Juliet McKenna: I've had a fun time too - thanks. Anne McCaffrey: I enjoyed it, too, since I don't travel much any more. Good hit! Moderator: It has been a real pleasure having you all here in Cybertown. Juliet McKenna: Even the technologically inept? Moderator: For all your insights to our budding SF authors. Juliet McKenna: It's nice to have the chance to pass things on -- after all hearing Anne speak in 1983 encouraged me to believe I could do it! Dennis Jones: A pleasure indeed! Copyright ©2000 by HarperCollins. All Rights Reserved. Reprinted with permission. Reproduction or dissemination of this transcript in any manner whatsoever is strictly prohibited.